Dr. Ambedkar was the main architect of the Indian Constitution. He was born in a very poor low caste family of Madhya Pradesh. In U.S.A., he did his M.A. in 1915 and Ph.D. in 1916. From 1918 to 1920, he worked as a Professor of Law. Dr. Ambedkar set up his legal practice at the Mumbai High Court. 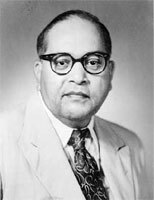 Ambedkar was the main inspiration behind the inclusion of special provision in the Constitution of India for the development of Schedule Caste people. Dr. Ambedkar was the Law Minister of India from 1947 to 1951. He took part in the Satyagraha of untouchables at Nasik in 1930 for opening the Hindu temples to them. Dr. Ambedkar was emancipator of the 'untouchables' and crusader for social justice. This liberator of the down trodden was affectionately called "Babasaheb". He was posthumously awarded 'Bharat Ratna' in the year 1990.